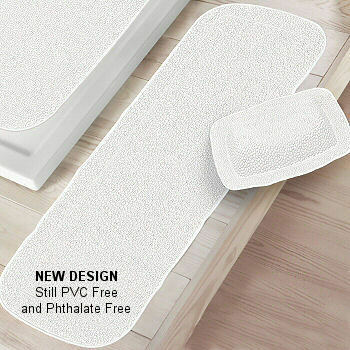 This anti slip, 100% PVC and Phthalate free natural rubber safety tub mat is designed and tested in Germany. Very durable, heavy weight natural rubber construction. The best shower mat and tub mat in the market today. The design is a pebble texture and is anti slip. Moisten the surface with water containing no bath products, firmly press down on the suction cups, starting at the center. Test slip resistance before entering. If the mat makes contact with bath oils, soap, detergents or solvents there is a risk of slipping. Limestone deposits and porous or uneven surfaces affect the adhesive strength of the suction caps. Easy care. Machine wash warm 104F 40C. Rinse, shake out and hang dry after each use to help resist mold and mildew. Do not dry on a heater or in the sun.